The base of the dinnette seat is installed, ready to be covered with ply. The dinnette will comfortably seat 4 adults, 6 at a push. It also converts into a double bunk, providing a temporary berth for a 5th and 6th passenger. The 3 dark blue marks (it’s just masking tape) on top of the framing are reminders for me to fix some paint. As much as possible I paint the furniture as it’s assembled on the bench, out of the boat. Once it’s installed, it gets any required touch ups. All the visible faces, which are clear-coated polyurethane will get a final coat once the fit out is complete, so that it looks just like a new one. 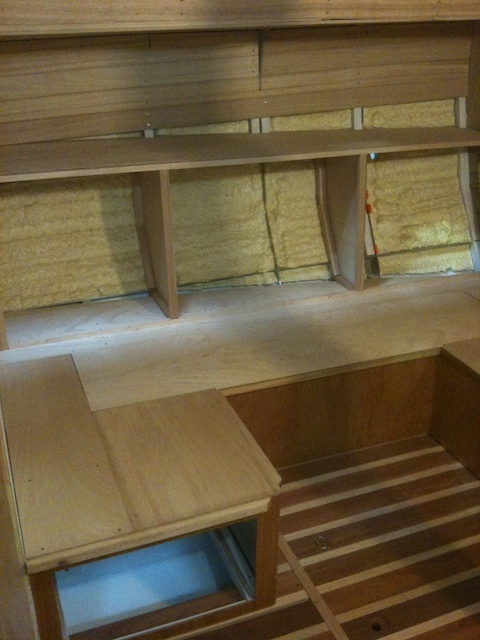 Another couple of shots of the dinette base, with the ply covers in place, but not yet fitted. 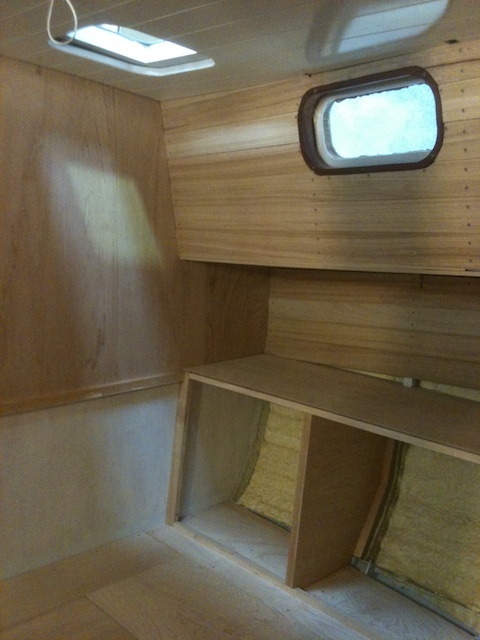 You can also see the framing for the backrest along the hull. Above and at the back of the seat, I’ve installed a shelf that will eventually have some cupboards and book shelves installed onto it. 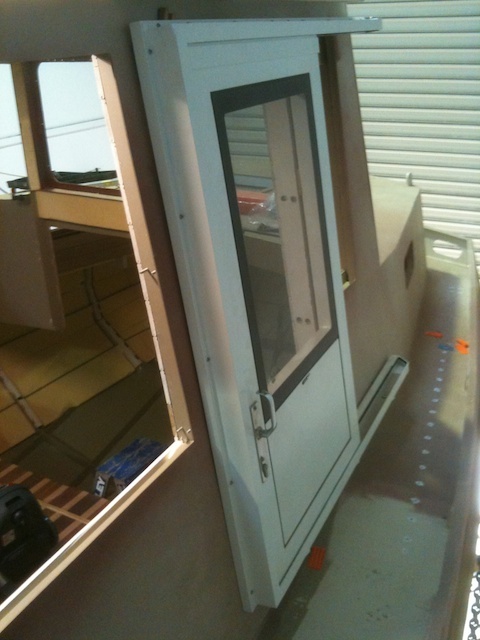 Inside and outside of the pilothouse, showing the installation of the lining and the first fitting of the sliding doors. 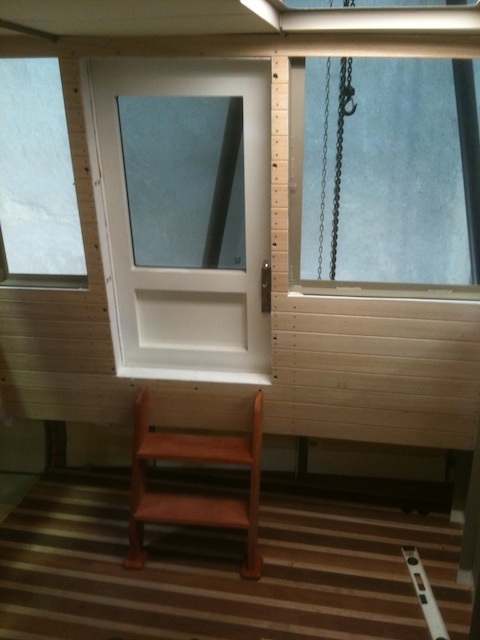 I had these doors made in Perth, and they are specially engineered to deal with bad weather at sea. There is still a bit of work to go before the door can be permanently installed. This work was done by my brother Greg before he returned to Brisbane. It will now sit until I get to the wheel house fit-out, probably in February. Enter your email address to follow Yamoya and receive notifications of new posts by email.